A couple of years ago, my husband decided that we needed a couple of cherry trees so we planted Queen Ann and Bing varieties with great anticipation of a bountiful crop to come in around the 4th of July, which for me always signaled that cherries were in season and if you really loved cherries, you had to be diligent and aware that cherry season was as fleeting as a feather in the wind. The first year we saw lots of growth but few cherries; the following year the trees finally got serious and plump looking cherries started to take shape, hanging from the tree limbs on thin stems. I calculated that in a couple of weeks, I would be harvesting the first of many homegrown cherries to come. On the appointed picking day, I made my way up the hill, basket in hand with visions of munching on a bowlful of cold cherries on the back porch later in the day. Horror! The trees were bare with nary a ripe cherry to be had. The birds had kept better watch than me and kindly left me the unripe ones along with the pits from the ripe ones that they had enjoyed. This was war! My solution was to cover the trees with fine green mesh bird netting, which I reluctantly did because it ruined the look of the trees and by the time I did this, most of the fruit was gone. As the days passed and cherry season with it, I managed to salvage a woeful bowlful. I vowed that next year would be different. I would be smarter than the birds! And that would mean planting enough cherry trees for them and for me! 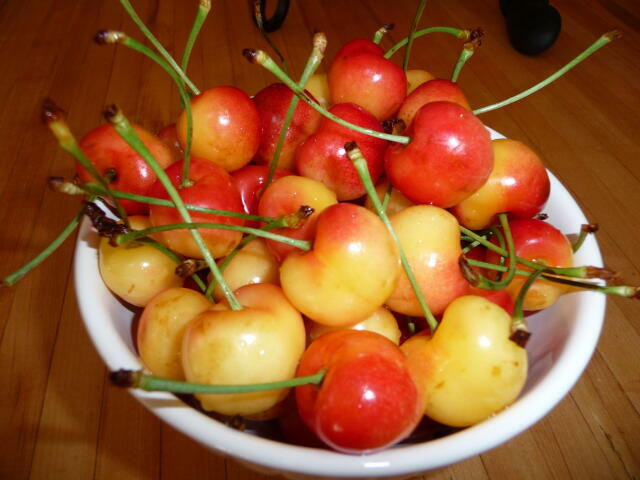 There are two types of cherries; sweet and tart and the tart varieties are easier to grow. Tart cherries are used for baking, especially the ubiquitous cherry pie and for making preserves. Sweet cherries, like the old fashion Bing cherries, are less disease resistant than tart cherries and they are the cherry of choice for most people. Have some fun this summer in the kitchen experimenting with cherries. They make a great sauce for poultry and pork and they are an eye-popping addition in a summer salad. For an easy sweet confection that can double as part of a summer brunch or stand alone as a dessert, a French cherry clafouti, which is traditionally made with black cherries, is hard to beat. Yum! What otber fruit do you grow? I think my most interesting are gooseberries.